Microsoft's Answer to Hosted VoIP Solutions or Not? Even if you don’t remember it, your parents or grandparents remember a day when a landline telephone was the only conduit via which they could conduct business other than in person. Well, the realm of business communications has for some time now involved multiple channels. Phone, email, instant messaging, audio conferencing and video conferencing are standard ways in which people connect and get work done. Today more than ever, we see these once individual worlds colliding as providers of all types push to develop and deploy “the” solution that will be all things to all people for business communications. Unified business communications solutions are likely the best example of this. These offerings aim to make obsolete the days in which you used multiple applications and clients for individual communication needs - none of which interfaced together. You likely used Microsoft Outlook for your email, a PBX-based desk phone and a cell phone - each with different numbers to dial and to display on outbound caller IDs - for voice calls, WebEx for online video conferencing and some other third-party application for instant messaging. Hosted VoIP implementations were the first solutions that connected some of these functions into single packages and applications. Not to be outdone, of course, Microsoft wanted to get in this game. The software giant has long struggled with how to integrate all of these communication forms into one, especially those relating to telephony. Its acquisition of Skype was to provide the path via which it could finally do just that. In an uncharacteristically quiet fashion, Microsoft retired its Lync product in early 2015, replacing it with Skype for Business. 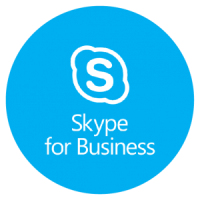 This action left many people asking if Skype for Business is the answer to today’s business communication needs? Can it and will it compete with hosted VoIP solutions that have already established a good stronghold in many segments? The best place to start when trying to answer these questions is to find out exactly what Skype for Business is and what it offers. A quick search for Skype for Business can lead you to a Skype for Business “home” page along with a “benefits” page. At first glance, Skype for Business looks to have everything and then some that a business large or small would want in a communications platform. Great security and an all-in-one communications platform is a pretty great thing, right? Promises include one solution for all voice, video and audio calls, instant messaging and online meetings accompanied by easy file sharing. Add to that integration with Microsoft Office programs - including the ability to initiate calls from an Office document, and integration with existing PBX phone systems (Server 2015 plan) and teleconference equipment, things just look better and better. Strong security and lower costs round out the benefits that you easily find up front. From this point on, however, things get murkier. The announcement and initial roll-out of Skype for Business may have been uncharacteristically quiet but the reality of how complicated Microsoft is making Skype for Business is sadly all too characteristic. Also a challenge - and not an unusual one - is how many of the initial promises are not quite yet fully available - and what limitations there are on those features that are available. For example, the application can only support meetings with up to 250 people and in reality there is no current support for hosted voice communications that can connect to the PSTN. Some functionality is just now rolling out in the form of preview apps. There is a limited window in which people can and must apply for these apps that are designed to provide an enhanced experience on mobile devices. Other preview apps are planned for down the road. This means that Microsoft has launched what appears to be more of an application in progress than a truly “ready-now” offering. How Many Versions Can You Have? It does not take long to realize there are many versions of Skype for Business. Realizing exactly what the difference is, however, is not an easy task. There appears to be Skype for Business, Skype for Business Online and Skype for Business Server 2015, all of which are referred to as “standalone” versions. Yet, when you go to the plans and pricing page, there is only a reference to the Online and Server versions, not a plain “Skype for Business” version. Then there are versions for Office 365 which are integrated into Office 365 rather than priced out separately. Good for Small Business or Large Business? In looking at the multiple iterations of Skype for Business that are available, it can be hard to identify which market segment Microsoft is targeting with this product. The sheer range of options from 3 standalone options to a full Office 365 integration would initially indicate that Microsoft wants to offer solutions for businesses of all sizes. However, the sheer fact that all meeting capacities max out at 250 participants is enough to show that there is no way Skype for Business in its current form could handle the needs of large businesses. Bottom line, Microsoft does not appear to have cracked the unified communications code. So Who Is Skype for Business Good For? Online meetings up to 250 people. The ability to integrate with Microsoft Office 365. Strong authentication and security rules with robust administrative control. Some user-level controls and permissions. Conference room-to-conference room video conferencing as opposed to simple 1:1 conferencing. Integration with existing AV equipment and infrastructure. Integration with existing PBX systems. To this list I would also add that Skype for Business is good for people who don’t mind limited functionality now with a potentially continuous roll-out of new apps and features that try to expand the usability of the tool. The new mobile app that is currently in preview mode for both iOS and Android devices makes using Skype for Business far more realistic. Larger phone numbers on the keypad facilitate easy dialing and video that fills the phone screen enables better viewing and sharing of information when meeting via a mobile device. Skype for Business vs. Hosted VoIP? So, can Skype for Business effectively compete with hosted VoIP solutions? At this time, the answer appears to be no as although users can make calls to other users, there is no functionality to allow external calls to the PSTN. Until Microsoft delivers this functionality it is unlikely that smaller businesses will embrace this offering. That being said, as a unified communications solution it is in fact a decent product although the requirement to integrate with existing telephony services means it is not really a unified solution. This all means that the product is in a bit of a no-man’s land for a target audience. In all fairness, it is important to reiterate that Microsoft will no doubt keep adding to the functionality of Skype for Business. Over time, it is highly possible that this application will not only meet the level of services provided by some hosted VoIP solutions but outdo them. However, the fact that Microsoft has taken and is still taking so long to “get there” could leave too many businesses feeling that it’s just a bit too little, too late. Microsoft recently announced that it's Skype for Business product now offers Cloud PBX and PSTN calling features. These are add on features that require a subscription to Office 365. While this makes it an even more intriguing option for businesses, be aware that there are still some limitations when compared to a regular VoIP solution. A reliabile connection to the Office 365 data center is required. There is currently a limited selection of Lync supported IP phones when compared to SIP. No way to support phone deployement in a common area such as a lobby.